The official opening of the refurbished and extended Perth Theatre coincided with the first matinee performance of the pantomime "Aladdin" on Saturday 9th December. Outshining all the opening speeches was the unexpected arrival of the Perth fire brigade as the performance was interrupted by a faulty smoke detector and the audience and actors had to evacuate. 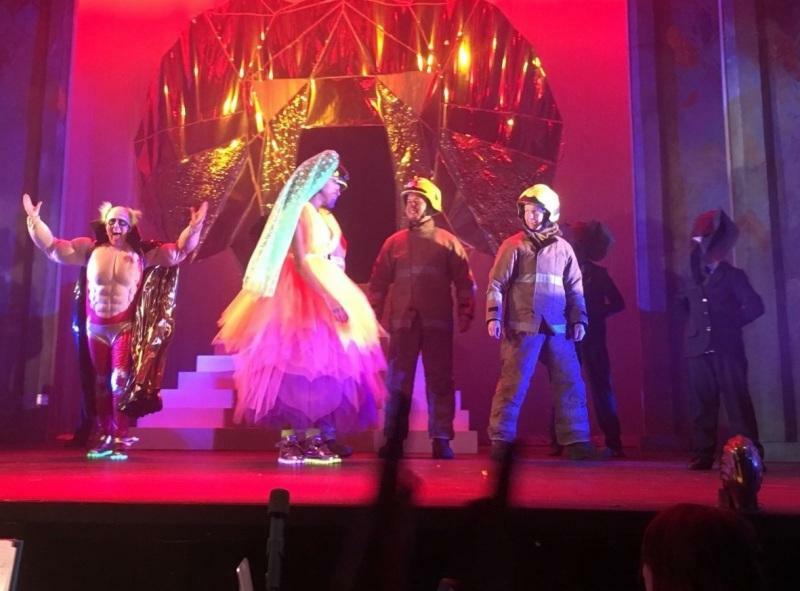 A quick thinking director wrote two of the fire fighters into the script and when the audience had resumed their seats they carried the pantomime dame onto the stage to huge cheers from the house. The publicity from this unexpected turn of events went viral! Click here to see new photos of Perth Theatre.Thanks to Colin McCredie on Twitter for the image above. The practice has been commissioned by the George Wyllie Trust to design a new gallery for the artist's work. This will be part of a much larger cruise liner terminal and restaurant on the quayside in George's home town of Greenock. A planning application is expected at the end of April. The UK Civic Trust awarded the Dunfermline Carnegie Library & Galleries a commendation at a ceremony in the Manchester United Hall of Fame at Old Trafford. A new house in the historic Fife village of Elie has been recommended for planning approval. 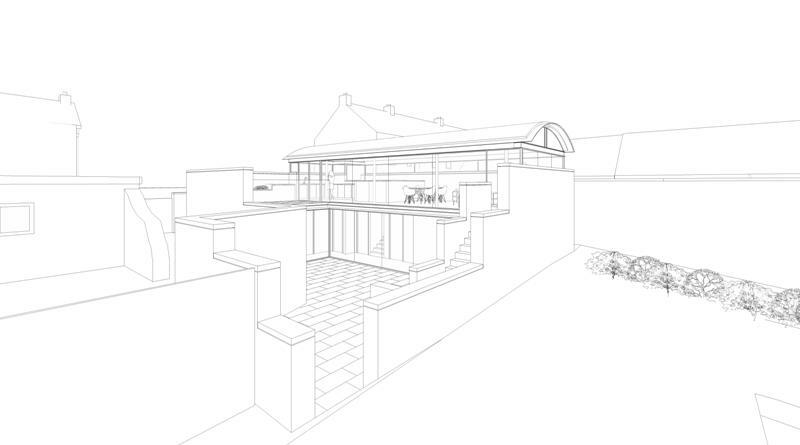 The house design is "upside down" with a the upper level being a continuous space under a barrel vault roof and although at the rear of an existing garden has views towards the sea. A new webpage has been created and more information on this project can be found here. A new house on the grounds of a large Victorian villa in the centre of St. Andrews is about to be submitted for planning permission. Our design strategy is to build a single storey building which extends the existing footprint and encloses a courtyard garden. Essentially developing the strengths of what exists already. This ground floor contains 4 large en-suite bedrooms, a generous central hallway and a utility/golf club room. A new webpage has been created and more information on this project can be found here. At the time of writing the practice have just completed in the space of four weeks four major invited competitions. The first was for a £42M extension and refurbishment project for Paisley Museum and Gallery. 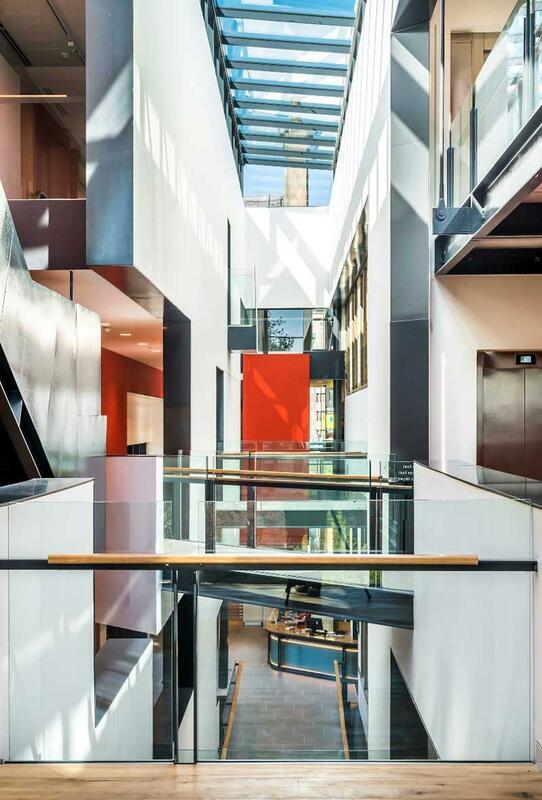 The second was for a €30M engineering faculty building on the historic campus of Trinity College Dublin. The third was for a major new housing development in central Edinburgh and the fourth was for an extension to the Edinburgh College of Art. We expect to hear on all four competitions in April. The Royal Scottish Academy "wunderkammer" designed for the exhibition "Ages of Wonder" has been re-assembled in a different format and permanently repositioned along one wall in the President's Room in the RSA. It and its contents can be viewed by appointment with the RSA. Richard is the deputy convenor of the RSA annual exhibition which includes the Architecture Open Exhibition this year and he will be hanging the architecture rooms. The exhibition is open to the public 5th May to 6th June. 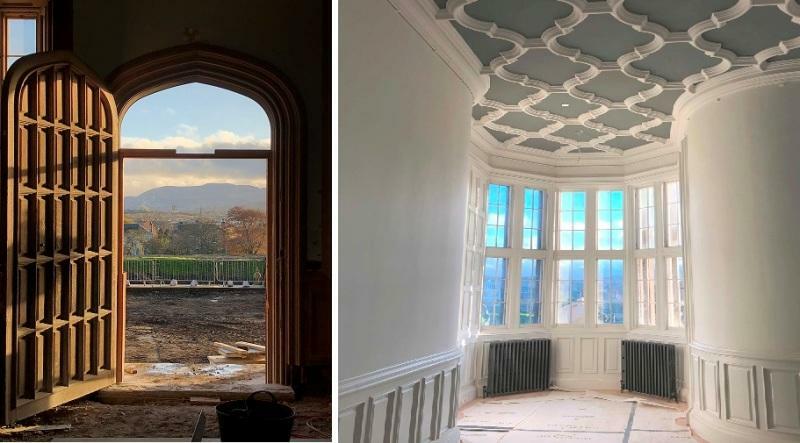 Both our projects at the former Donaldson's College are progressing apace. City and Country Ltd. are developing the original Playfair building and have opened show flats and launched a sales website here. Meanwhile the CALA development to the north is rapidly taking shape. The steel frame for one of the two crescents is now almost complete and the spatial intentions and the framed views from the flats can both be experienced. 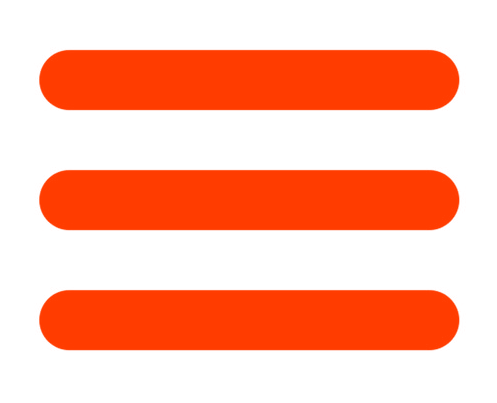 More infromation can be found on the CALA website click here. Our major new house in Dalkey outside Dublin is on the home straight with the exterior almost complete and the interior rapidly progressing towards a May hand over. For more information on this project click here. Meanwhile our "secret" house on Tipperlinn Road in Morningside Edinburgh is similarly expected to be completed in May. For more information on this project click here. In Caernarfon the two new cinemas, new foyer etc. is part of our extension to the arts centre "Galeri" (completed in 2005) and is now fully framed out and external cladding is beginning. The project is due to be completed in August. For more information on this project click here. 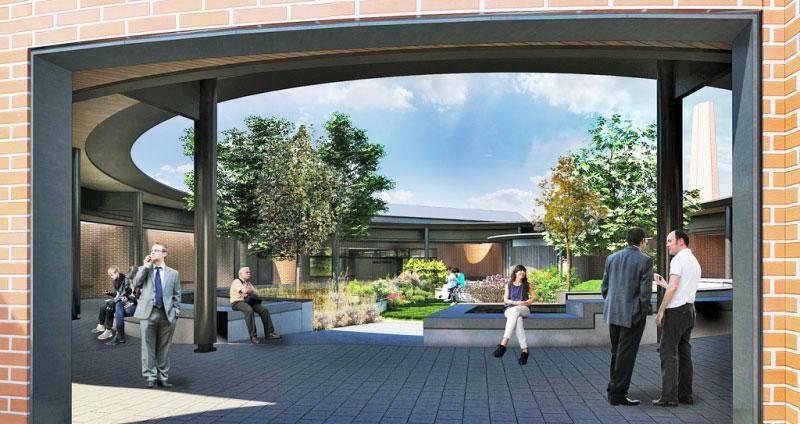 Our second extension to the world's first Maggie's Centre at the Western General Hospital in Edinburgh is now underway. The works will be in two phases followed by extensive landscaping. The first phase constituting the main extension should be finished by end of August with the second phase later in the year. The contractor is John Dennis. For more information on this project click here. 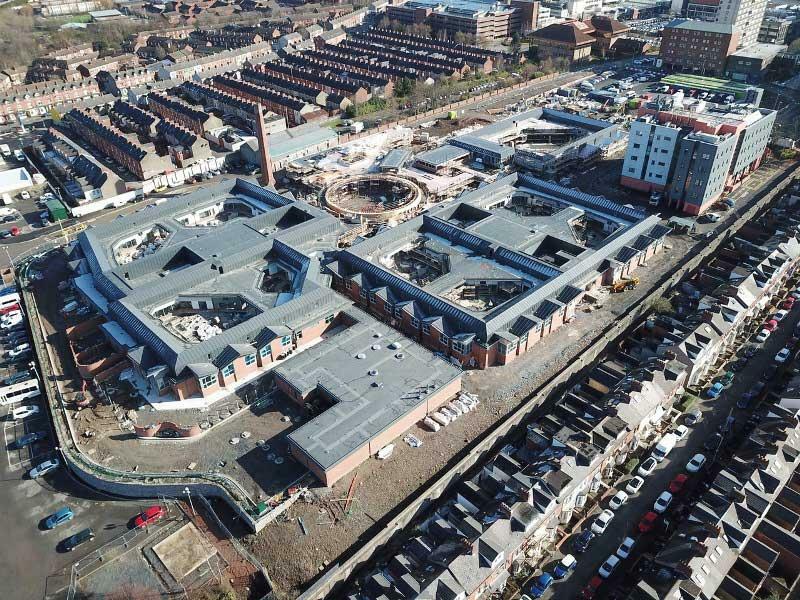 This very large project in collaboration with Belfast architects RPP for an 80 bed acute mental hospital progresses apace and is now more than half way through its programme. All the major spaces can now be seen and in particular the sequence of courtyard gardens appreciated. For more information on this project click here. 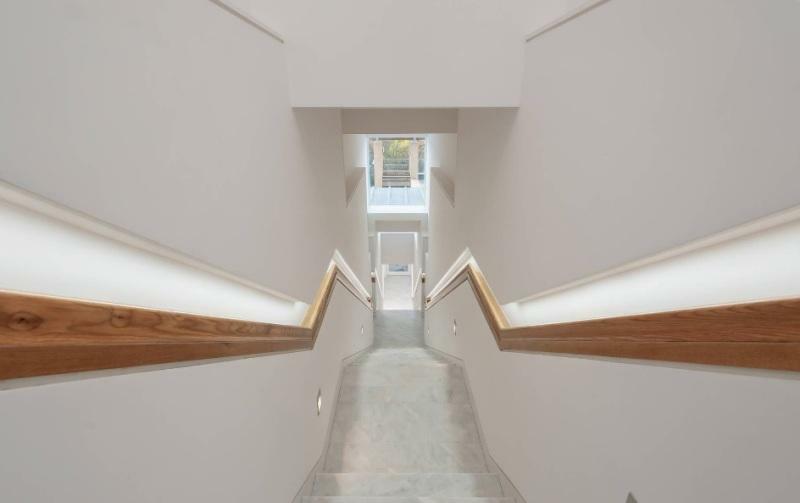 We have recently completed the alterations and extension to a listed New Town apartment that has seen a completely new basement level constructed in the garden. This provides a master bedroom suite as well as creating a new external terrace above, overlooking Dean Gardens, complete with Belvedere. A new internal cascading stair was inserted to link these to the upper entrance level where the grand dining room and timber panelled library were restored. Photos courtesy of SquareFoot Media (www.squarefootmedia.co.uk). 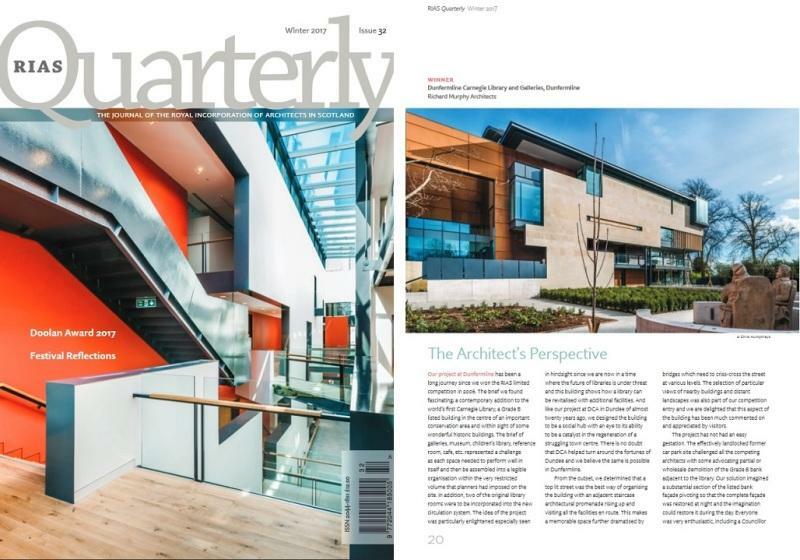 Following on from winning the RIAS Andrew Doolin prize, Scotland's ''Building of the Year'' last Winter, we were featured in the Winter edition of the RIAS Quarterly. Hart Street was featured in an edition of The Design Guide in February. '' 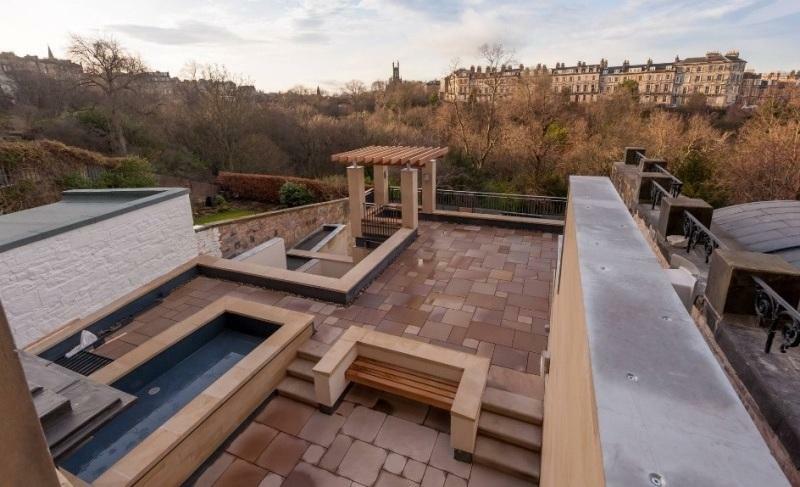 Scots architect Richard Murphy freely admits he has over-designed his own home, descriding it as 'an enjoyable vehicle to develop a lifetime's themes'. And we are delighted he has, as it's a tour de force in the study of detail, materials, and how colour can be integrated in architecture. In his essay, the architect gives us a sense of the project's many layers and intricacies.'' Hart Street was also featured in a magazine called Mas Reino Unido, a magazine for spanish speakers in the UK which is published every two weeks. Our Donaldson's New Build project was featured in Edinburgh News newspaper in February as the first phase of flats were released for sale. An article in The Scotsman titled ''David MacDonald: Well-designed buildings have the power to change lives'' was published in January. '' The importance of good design, such as that of the Dunfermline Carnegie Library & Galleries, cannot be underestimated as it leaves a lasting legacy within communities as the functional design helps support the delivery of improved public services, which is a core function of SFT’s work and the hub programme.'' Read more here. A new book “Architects’ Houses'' by Michael Webb and published by Thames and Hudson is an international survey of 30 contemporary houses designed by architects for their own use. 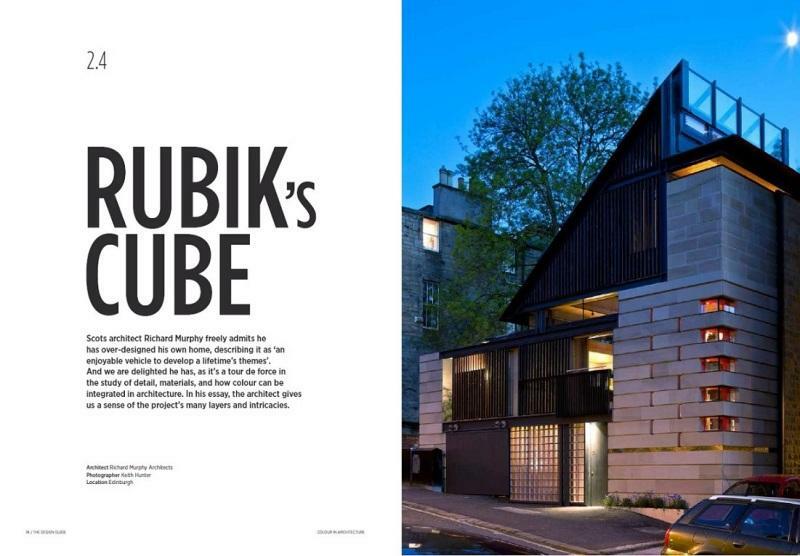 Richard’s house in Hart St Edinburgh is featured extensively and is indeed the only house from the UK in the book. Richard is rubbing shoulders with Norman Foster, Todd Saunders, Jim Olson, Kerry Hill, Tod Williams and Billie Tsien and Gunther Domenig, to name but a few. Thanks to the Melbourne School of Design for the filming and editing. Richard was the guest speaker at the Aberdeenshire chapter of the RIAS annual dinner and will be speaking to the Stirling Chapter on the 19th April at 5.30pm in Forth Valley College about the work of the practice. He also talked to students at Huddersfield University School of Architecture and students from University of Ulster in Belfast. He is due to talk on 24th April at 700pm to the Inverleith Residents’ Association AGM and on the 11th May at the RIAS Convention in Aberdeen. The new book "Carlo Scarpa and Castelvecchio Revisited" was officially launched at three consecutive book launches: at the RIBA Bookshop on 6th December, at the Royal Scottish Academy Edinburgh two days later and then finally at the Verona Institute of Architects on the 19th December. The President of the RIBA Ben Derbyshire and Paul WIlliams of Stanton Williams spoke in London, in Edinburgh the President of the RSA Arthur Watson and Alba Di Lieto from the Castelvecchio Museum spoke and in Verona a whole panel of Italians spoke culminating with Richard giving a lecture in Italian. The book has been very favourably reviewed in the December 2017 Architectural Review (it was their "book of the month") and in the March RIBA Journal. A further review is expected in Architecture Today in April. Sales are going remarkably well both direct on the internet and though bookshops around the world. If you wish to purchase a copy (postage to anywhere in the world is included in the price) go to this website: www.breakfastmissionpublishing.com. Alternatively if you visit the office at 15 Old Fishmarket Close, EH1 1RW, you can buy a copy with a £5.00 discount. RIBA Bookshop London; AA Bookshop London; RIAS Bookshop Edinburgh; Royal Scottish Academy shop Edinburgh, Scottish National Gallery shop Edinburgh , DCA shop Dundee, RSUA Bookshop Belfast; RIAI Bookshop Dublin; Architectur & Natur Amsterdam; Netherlands Architecture Museum Rotterdam; Limond Verona; Castelvecchio Verona; Querini Stampalia bookshop Venice; Cité de l’Architecture et du patrimoine, Paris; Livraria ARFAUP Porto; Bucherbogen am Savignyplatz Berlin; Missing Link Bremen; Hochparterre Buecher, Zurich; WIlliam Stout Bookstore, San Francisco; Peter Miller Bookstore Seattle; Hennessy and Ingalls Los Angeles; CCA Bookstore Montreal; URO Bookstore Melbourne; Folio Books, Brisbane. The talented chef and office friend Barry Bryson and our very own Great British Bake Off star Tom Hetherington will be doing a demonstration ahead of this years Kitchen Table Day in support of Maggie's Centres at Jupiter Artland on Friday 20th April from 12:00 to 15:30. Tickets to the event will be in the form of a donation, made payable to Maggie's, £35 recommended. 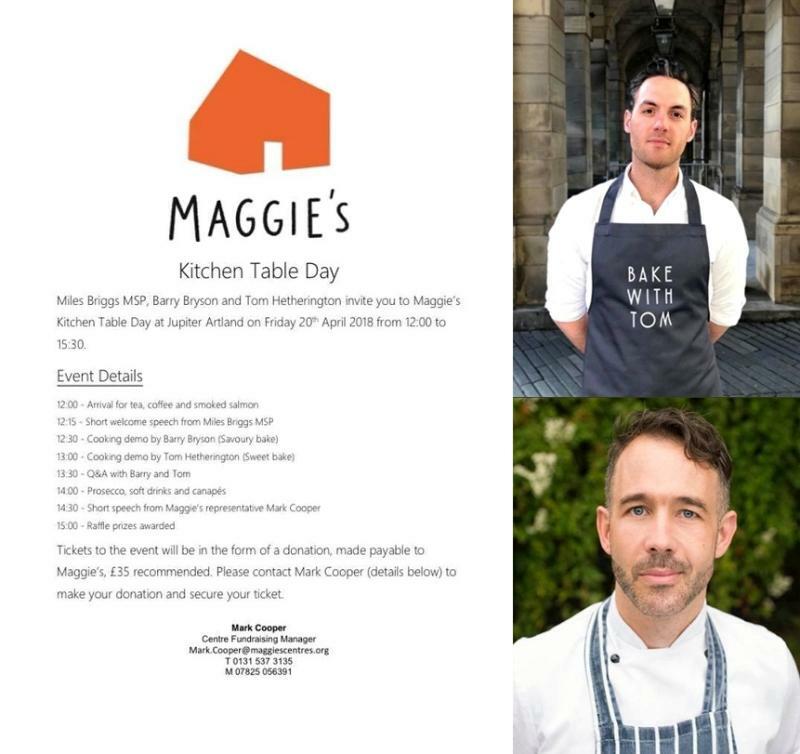 Please contact Mark Cooper at Maggie's to make your donation and secure your ticket; mark.cooper@maggiescentres.org or phone 0131 537 3135, more details on Maggie's Kitchen Table Day can also be found here.